The decision to run a ship in a market depends upon the price offered by the charter market. Charter rates should be at least higher than the operational costs. If the charter prices are not good enough then the ship might be laid-up or even scrapped depending upon its age. The lay-up cost would depend upon whether it is a cold or a hot lay-up. If a decision is taken to scrap the ship then the ship-owner would have to take into consideration the market of second hand steel and the applicable environmental regulations. At the same time, the selling of the ship is also an option, but generally it is difficult in tough market conditions. 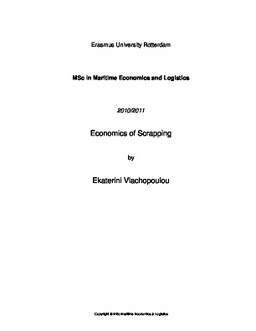 The main inquiry of this thesis is to identify the factors which are affecting the decision of a ship manager whether to charter, sell, lay-up or scrap the ship. A literature review of the different environmental regulations related to scrapping will be part of the thesis. The reason is that environmental regulation will have a big impact on Ship demolition in the future due to the growing impact of environment globally. The required data will be second scrap value, charter rates, second hand ship sales figures, scrapped ships, laid up ships, scrap prices, lay-up cost, operations and capital cost of a ship for a particular time interval. At the same time all the environmental regulations should be taken into consideration. The Decision analysis has been used as a methodology to understand the various situations for the ship owners to operate or layup the ship. At the same time, data related to payoff of scrapping a ship and other demolition data have been used to analyze the important factors which lead to the scrapping of the ship.